Astronomers at the European Southern Observatory using the Atacama Large Millimetre/submillimetre Array (ALMA) have discovered a massive ancient cosmic collision over 90 percent of the distance across the observable universe. The collision observed is part of the early formation stage of one of the largest type of structures in the known universe. 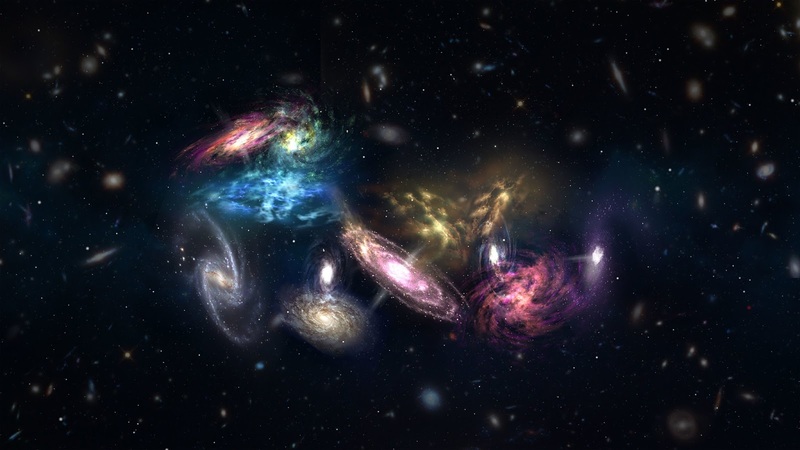 Recent findings suggest that the process took significantly less than time than models suggested and it raises questions about how galaxies evolved. According to the National Radio Astronomy Observatory, the individual galaxies in the cluster are held together by dark matter. During the universe's first few million years, matter both visible and dark began to collect into larger concentrations, eventually creating the first galaxy clusters. SPT2349-56 is a so-called protocluster, considered to be the building-block stage for galaxy clusters. "The lifetime of dusty starbursts is thought to be relatively short, because they consume their gas at an extraordinary rate," said Iván Oteo, a postdoctoral researcher at the University of Edinburgh. "At any time, in any corner of the Universe, these galaxies are usually in the minority. So, finding numerous dusty starbursts shining at the same time like this is very puzzling, and something that we still need to understand."